After completing its liberation of Deir ez-Zor, the last stronghold of Daesh (ISIS) in Syria, Sputnik Arabic was invited to film what infrastructure, weaponry and provisions have been left behind by terrorists. Have a look. The Syrian army has taken control of an extensive network of tunnels which had been used by the terrorists in the city of Deir ez-Zor and the adjacent suburbs. Most of the underground corridors are located on the west bank of the Euphrates river between the cities of Deir ez-Zor and Mayadin. The tunnels stretch to the settlements of al Mohassan, al Buomar and al Bulil, interconnecting them with each other. The underground passages were of vital importance for militants, allowing them to flee from the Syrian army and avoid airstrikes and clashes with the army. Terrorists also located their command posts underground, as well as ammunition and supply depots, and kept imprisoned civilians there for months. Due to its previous experience, which it gained in the suburbs of Damascus squeezing terrorists out of their narrow bunkers, the Syrian army was able to conduct its military operation in Deir ez-Zor as quickly as possible. Six years into the war in Syria, the Syrian army has recaptured and eliminated large quantities of military equipment and hardware left by militants. The largest amount of ammunition was seized in the city of Mayadin, where terrorists left dozens of tanks, guns and ammunition because of the rapid assault of the Syrian army, which was supported by Russian air units. 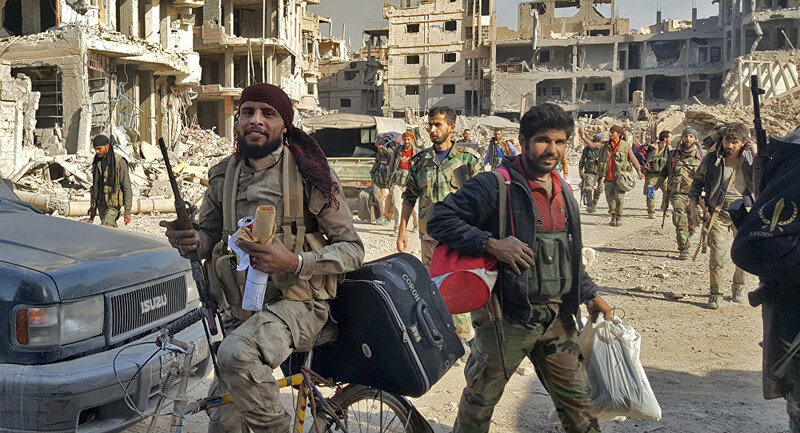 The settlement of al Mohassan, which is located on the east bank of the Euphrates, 20 kilometers from Deir ez-Zor, was the major foothold of terrorists and part of the supply chain between Deir ez-Zor and Mayadin. There terrorists stored their food supplies which were delivered to several frontlines. When the Syrian army took it under control, it was able to break up Daesh defense line to the south of Deir ez-Zor. Despite the attempts of terrorists to stop the advance of troops with suicide attacks and cars packed with explosions, the army continues strengthening its positions on the east bank of the Euphrates. The recapture of al Mohassan will speed up the advance of Syrian troops towards the city of Al-Bukamal on the border with Iraq, the last terrorist-held territory in the east of Syria.